Much confusion presently exists in esoteric literature as to the exact meaning of the term “Karma”, and as a result one will find that the notion is susceptible of misleading shades of definition and interpretation among contemporary writers on the subject. Until 130 years ago, the concept had little or no meaning to the inhabitants of the Western world; and it was only with the introduction of the Theosophical Society and the teachings of Blavatsky that Karma, along with the notions of reincarnation and the Oneness of Life, entered into the mainstream. Today, despite its widespread popularity as a concept, Karma is often misunderstood and misrepresented as a mere shadow of its true depth and complexity; watered-down by the effects of its adoption in mass culture and inclusion in common and colloquial parlance. Theosophically speaking, Karma may be described as referring to the Spiritual Law of Cause and Effect which is inherent in the very fabric of the Universe. As such, it is immutable and changeless, acting automatically and invariably in the evolution and order of the Cosmos in which we exist and have our being. When applied to the life of the individual, it may be regarded as the ultimate Law of Justice, whereby one reaps the results of one’s own sowing, enjoying or suffering the results of one’s own actions, and which operates along the lines of individual experience, life, and character. It is entirely impersonal, and yet infinitely fair in its working. In this sense, Karma is much like the natural laws of mathematics and physics, operating along exact lines and bringing forth exact effects in accordance with the invariability of its law. It stands beyond the questions of good or evil, reward or punishment, morality or immorality, and so forth; acting rather as a great natural force over and above any such questions of human conduct. Karma is not something imposed upon us by the arbitrary judgement of a revengeful god or the spiritual powers that be; as an absolute Law, it should be regarded rather as the manifestation of effects in accordance with the causes we have set into motion – it is simply the Law of Cause and Effect. Fig. 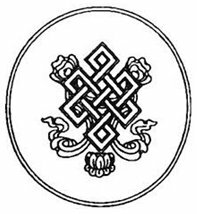 I – The Endless Knot: an Asian representation of Karma symbolising the interweaving of Cause and Effect as a Karmic cycle that continues perpetually. Karma is thus known solely by the evidence of its effects in the phenomenal world, which are likewise mirrored in the life of the individual. We do not perceive Karma in itself, nor do we fully understand the essence of Karma, yet we do know how it works by the nature of its invariable Law, which is constant and unchanging, and as a result we may accurately predict and define its mode of action. As the Law by which every action must result in an equal reaction, Karma may also be considered as containing a harmonising principle; it is only by the Law of Karma that the Universe maintains its equilibrium. The whole cosmic process in action is according to the Law. We know from Newton that to every action there must be an opposite and equal reaction: Cause and Effect. This Law is Universal Law which orders and balances the rhythmic workings of the world, keeping the universe in this state of perfect equilibrium. Without such constant balance and adjustment, the Cosmos would collapse in a ravaging tempest of chaos and confusion – atoms would burst asunder and planets fly off their courses. Scientific knowledge would become an impossibility, as there would be no laws by which to predict the patterns of phenomena. The Universe would, in fact, cease to exist altogether. Fig. 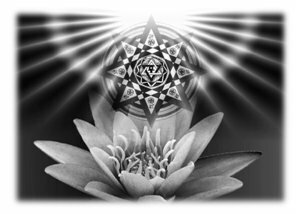 2 – The Lotus: a symbolic representation of Karma in many Asian traditions, on account of it simultaneously carrying its seeds within itself while it blooms. The seed symbolises the Cause, and the flower, the Effect. Karma, as the Law of Cause and Effect, stands at the substratum of scientific study and systemisation, and as such underlies the observations and experiments of all empirical systems of enquiry. The exact operation of the Law, and the means by which it manifests in the phenomenal world, remain points of contention among the various schools of thought, yet the fundamental necessity of such a principle of causation is held as axiomatic by all. Indeed, to do away with Karma would be to relinquish the world to the dominion of chance; that fictitious shadow of existence before which men grovel and fret in submissive surrender to the predicaments of environment. There is no randomness in Nature; the Universe courses through its ceaseless cycles with clockwork constancy. To arrive at any understanding of the nature of existence and the invariable Laws of the Cosmos one must first apprehend this eternal Law of Cause and Effect, for without it there would be total chaos, and all phenomena would lack sequence or structure. Harmony – Hierarchy – Correspondence - Order – these are all the progeny of this basic elemental Law. Karma is thus oftentimes spoken of as the “Law of Laws”. As such, it may be considered as a natural law – underlying all conditions and laws of phenomenal existence. Karma is the pendulum suspended between the motion of its swing; the interrelation of everything in the Eternal Now. The fundamental condition of Nature is one of constant change, yet Karma is that force of equilibrium which holds the polarity of life in balance. The constructive and destructive forces in Nature are engaged in perpetual warfare and struggle – one striving to build up, and the other to tear down – the result being that nothing is ever truly stable but rather in a continual state of change. Cycles follow cycles in an eternal progression of recurrence. Worlds, nations, units, and individuals have their birth, growth, apotheosis, decline, and eventual death. Like the ocean’s tides, all existence, great and small, has its rise and fall, its ebb and flow; its rhythmic compensation. Change is in constant operation; activity is the mechanism of Nature. Nothing is stationary. All is flux. Everything flows. All is change. Everything passes. All things rise, and in turn, fall. Creation, destruction, and regeneration are the unremitting trinity of Universal Law. In the twinkling of an eye Nature experiences a million births and a million deaths. And yet, Nature exists ever, birthless and deathless. This is Karma – the creator of the constant amongst the change. 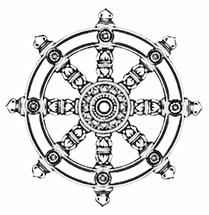 Fig 3 – The bhavacakra, or Wheel of Life, in the Buddhist tradition. In Buddhism, it is our intentional actions (or Karma which tie us to the cycle of rebirth in Samsara – a beginningless and ever-ongoing process; the sequence of which may only be stopped by following the Buddhist Path. Under Karma, every Effect is determined by its Cause. Such may seem to be a statement of the obvious to the reader, yet when fully appreciated the fact of this may drastically shake the seeming surety of one’s pedestal of common sense. How often do we speak idiomatically of “chance” and “luck”, as if events in our lives occurred at random, devoid of prior causes! It seems the conceptions of “chance” and “luck” are rooted deep in the fabric of our cultural subconsciousness – taken for granted even – and as such are not easily shaken off. This is the illusion of fortuity. A world in which “chance” and “luck” exist would be an idle one, as random occurrences do not require any scrutiny of thought nor effort of will. There would be no motivation, as there would be nothing to accomplish. In such a world periodicity would not exist; there would be no cycles by which Nature may run her rhythmic course, and as such there would be no weather – no seasons – no tides. Things would simply happen, irregardless of one’s actions or lack thereof. In a world without Karma, chaos would reign. There can be no exception to this Law. Nothing can happen outside of Cause and Effect. What we ascribe to the domain of chance is merely that which falls outside of our limited scope of understanding. In our limited state of consciousness, we attempt to restrict Nature to the realms of finitude, fancying that as our senses perceive, so must Nature be. While yet in truth, we are as fish in a tank, oblivious to what lies outside our microcosmic habitat besides a peeping glance with fisheye lens through the distorted glass. The conception of chance is therefore a divisive one, as there can be no notion of unity in a world which lacks order. It is only by a recognition of this Law that we may begin to understand the principles underlying the operations of Nature, and by such, rise above the material plane of life, placing ourselves in touch with the higher aspects of our being. In so doing we may become Masters of Destiny, forming a conscious part of the Law, and thus determine our own Karma. We become the Cause, instead of the Effect. Theosophy offers us the knowledge whereby we may arrive at such an understanding of the Law of Karma. It reveals to us the indisputable fact that we ourselves are the architects of our own futures and the builders of our fate. The Law may be used to mold and shape our destinies through the right use of free choice and will; there is no fate but what we ourselves make. Karma is a river that winds ever onward, from past to present, and from present to future; it is fluid, and flows ceaselessly into the ocean of possibility. There we swim amid the waves of the vast, infinite sea; a light unto ourselves, from which encroaching shadows flee. H. P. Blavatsky. The Key to Theosophy. The Theosophical Publishing Company, London. (1889). Dr. Annie Besant. A Study in Karma. The Theosophical Publishing House, Adyar. (Second Edition, 1917).